Soundings January 2019 – Eco Alianza de Loreto | Loreto, B.C.S. For some of us it seems surprising that a new year is upon us and that almost a month has already slipped by. 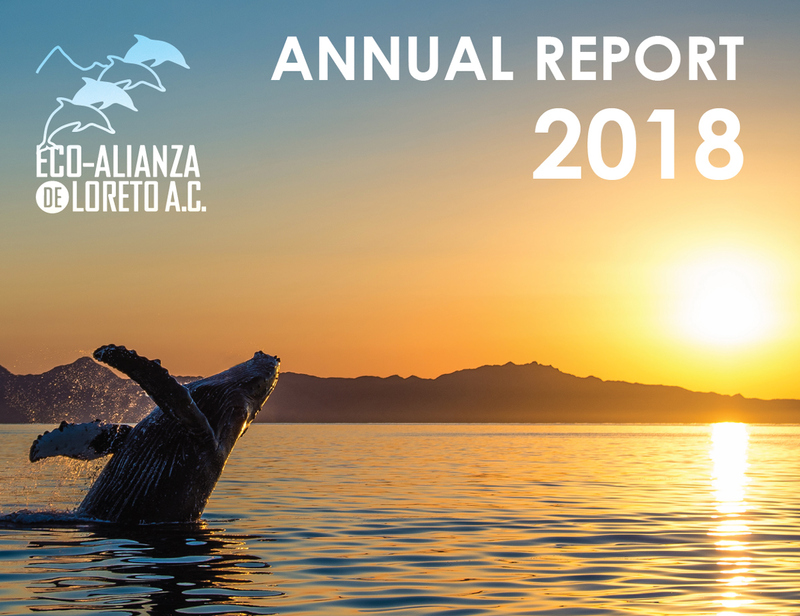 At Eco-Alianza we’re still exceedingly proud of the year just passed, and want to share with our supporters a glimpse at some of the highlights. CLICK HERE FOR OUR 2018 ANNUAL REPORT. 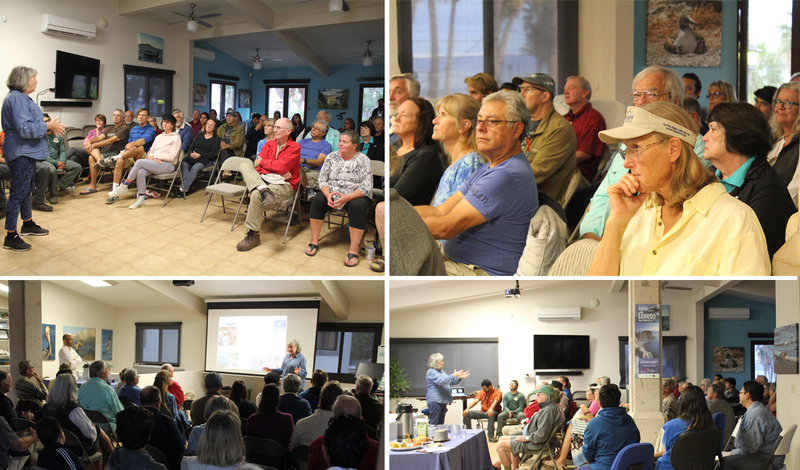 Cathy Busby, Professor Emerita and Research Scientist from the University of California Davis, on January 10 energized a standing-room-only crowd at Eco-Alianza’s CenCoMA headquarters with her enthusiasm about geology and planetary processes. Her presentation, “The Geological History of Bahía de Loreto National Park,” may sound dry on the surface, but as Cathy delved into the details of plate tectonics and rift volcanoes and other geological technicalities, her good humor and obvious love for these subjects brought the region’s geological history to life. With a presentation peppered with numerous question-and-answer sessions, Cathy shared animations showing the 12-million-year formation of the Gulf of California rift zone as the Pacific Plate moves northward away from the North American Plate, ripping part of the continent with it. The Baja Peninsula continues to move northward and westward, she said, at the rate of about 2.5 centimeters per year, or roughly the same rate as your fingernails grow. Through analogies, stories, and informative slides, Professor Busby explained all manner of geological concepts (e.g., tectonic divergence and convergence, slip faults, subduction, rift volcanoes, and pyroclastic flows). With local examples of these geographic processes she revealed this region’s fascinating history and even predicted the future, where a mere 10 million years from now, part of California will be pulled away from the North American continent. Professor Busby also promised to return for more field work here and elsewhere on the peninsula, where she works annually with 10 Mexican and American students, teaching them how to do geological research – collecting rock samples, conducting laboratory studies, and gathering, compiling, and presenting data. Although the “official” Bird and Wetlands Festival takes place this coming weekend, Eco-Alianza’s educators, along with its colleagues in the REAL (environmental educators network of Loreto), have been working for the last few weeks to energize and educate children about the topic. The avian biodiversity of Loreto, fueled in part by its estuaries, arroyos, and other wetland ecosystems, is truly world-class. 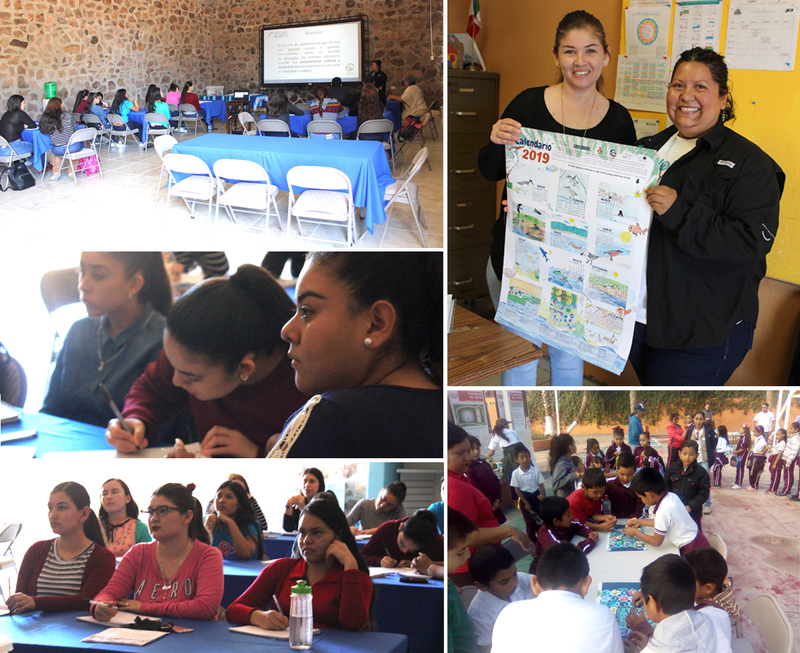 On January 16, Eco-Alianza educators presented a Conservation Teaching Strategies workshop to the students of Marcelo Rubio Ruiz school, who are working towards the Primary Education Bachelor’s degree. They learned techniques to impart knowledge of environmental education to their future students, and participated in a field trip to put into practice what they have learned. The children of the Club Huella Verde (Green Footprint Club) of Modesto Sánchez Mayón High School were taken on January 17 to the Las Garzas Estuary wetlands area where they explored the topic of “Beaches, Birds, and Wetlands,” observing wading birds, gulls, and other flora and fauna typical of estuary habitats. During the weekend festival, Eco-Alianza educators will team up with staff of the Marine Park, leading children through various educational and recreational activities connected to Loreto’s avian fauna and the importance of conserving wetlands. For more information about the Bird and Wetlands Festival’s activities, click here. Also celebrating wetlands as partners with the Ensenada nonprofit ProEsteros, Eco-Alianza has been a co-sponsor of their 6th annual wetland photo contest, which ended January 15. Winners will be announced at the Ensenada Historical Museum on February 2 to celebrate International Wetland Day. For more, check out wetland information and beautiful galleries and videos on http://www.ProEsteros.org or on their Facebook page. “Nature Notes” is a monthly short feature detailing some of the wondrous, seasonal activities taking place around us. Costa’s hummingbird (Calypte costae) showing only black on gorget. Costa’s Hummingbird at a viewing angle that causes light wave interference and produces iridescent magentas and purples. Xantus’s Hummingbirds (Hylocharis xantusii) showing different intensities of color at very slightly differing angles of light. Northern Shoveler (Anas clypeata) is one of a pantheon of waterfowl that have structurally colored feathers, think Mallard (Anas platyrhynchos). This adult male’s head can range from black to purple to green with very slight changes in viewing angle. Some of us have had the great good fortune to see male hummingbirds with their “true” gorget colors on full, breathtaking display. Others, alas, have just seen little black-throated birds flitting about. Structural coloring is the phenomenon that causes this seeming contradiction. If you slap a coat of red paint on a wall, sunlight will cause the red pigments in the paint to reflect red wavelengths of light. Sunlight emits wavelengths from the very long red end of the visible spectrum to violet at the shorter end. Simple stuff. Structural color needs very distinct angles of light to reflect colored wavelengths by a process called light wave interference. Light wave interference comes in two flavors which are dependent upon the angular relationships among the light source, the subject, and the viewer; constructive interference which produces colors, and destructive interference which produces black. The structures that affect bird feather coloration may be angled barbules, minute particles, and/or other microscopic structures, all of which, either singly or in concert, scatter and refract differing wavelengths of light. 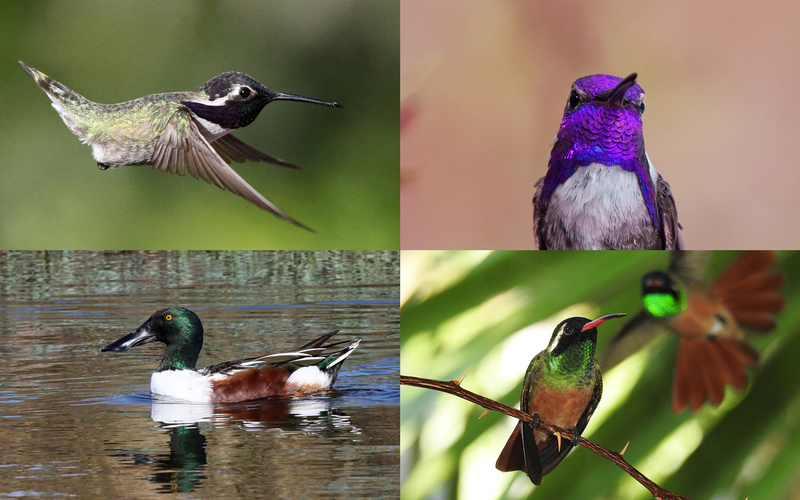 Some birds have both pigmented and structural kinds of coloration, combining normal reflection with various light wave interfering structures to produce amazing combinations of color and iridescence. Peacocks are a great example of just how dazzling these combos can be. The Peacock’s feathers are only pigmented brown, but they have an arsenal of structures that produce varying colors and include microscopic layering that produces iridescence. Oh, and speaking of hummingbirds should remind us that their very long breeding season has already begun. They are in much greater danger of pesticide ingestion as they consume and also feed their offspring much insect protein during this cycle. Please take care with that deadly stuff. Please mark your calendar for March 29 and March 30 and join us for the second annual One Ocean Film Festival, to be held in our CenCoMA courtyard. Details to come!